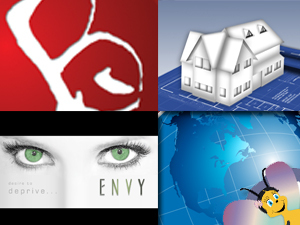 We provide graphics design services that are professional and high quality. Like it sporty, fancy, frilly, technical, simple, elaborate, detailed? Yeah, we can do that. Q: What's the difference between graphics design and logo branding? A: Graphics design is just for creating graphics for electronic or print media. Logo branding is specifically targeted for print services and can also be used for electronic media. Logo branding also includes design for stationary, letterheads, envelopes, labels, and business cards. Q: Can I use a graphic you provide as my logo? A: Yes, you can, but you will not receive any of the extras that come with logo branding. Q: What is the process that is involved with graphics design? 1) We begin by researching your industry, similar graphics, copyrights and trademarks. 2) We develop five (5) unique designs based on your input, samples provided, and limitations due to copyrights, trademarks and service marks. 3) We send the proofs to you and you select which ones "catch your eye" in some way and we move forward with revisions on those designs. 4) Revisions are made to the existing proofs and new proofs will be sent to you for review once again. 5) Steps 4 & 5 will be repeated until we hit the mark of what you want. 6) Once you decide on a final design** that you are happy with, this design will be finalized, all copyright marks removed and sent to you with a copyright transfer. Graphics design deposits start at $50. Additional deposit may be required depending on the complexity of the project requested. What kind of graphics do we design? **All graphics and revisions produced by Brozra Web Solutions outside of the final approved design will be property of Brozra Web Solutions LLC. Customer will only get copyright transfer for the design proof that they approve for final distribution.